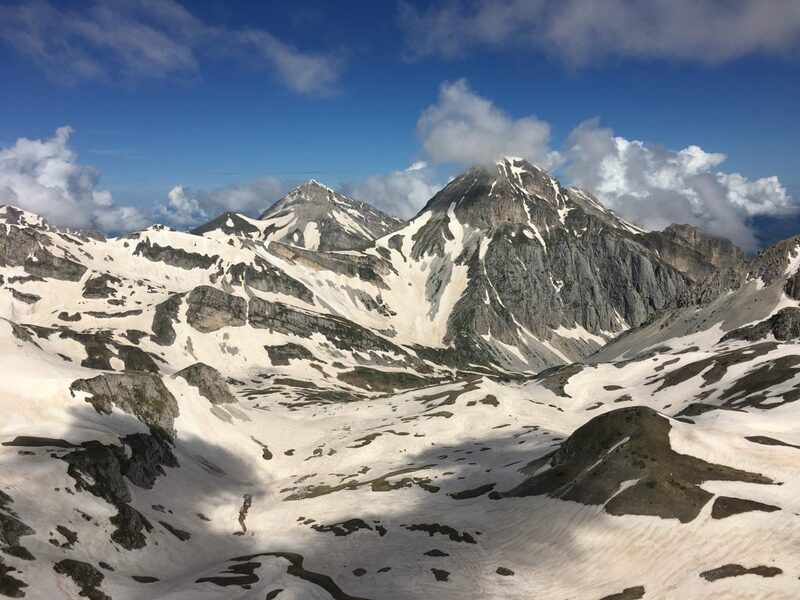 Although we’d deliberately decided to stay lower down the mountains, the lure of the snowy heights proved too much and we decided we had to go up to Campo Imperatore to see the main peaks at closer range. 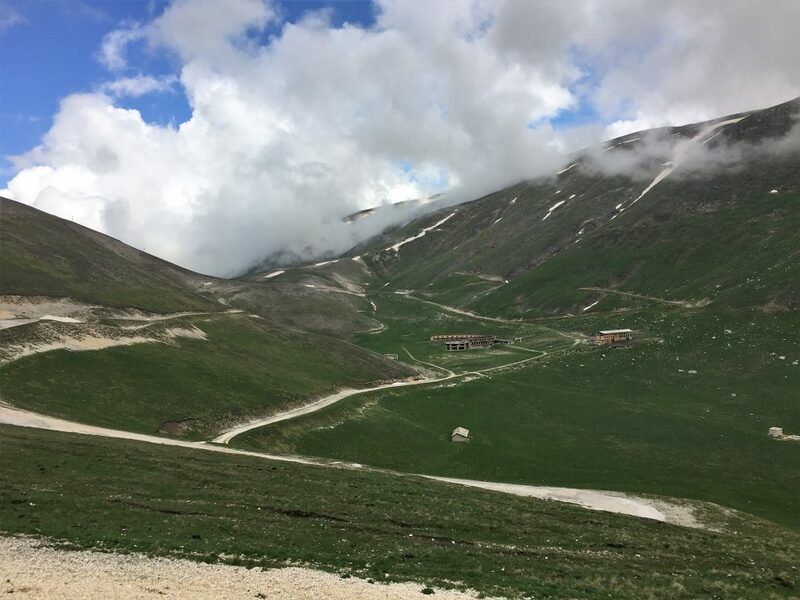 We could have gone up in the cable car, but it seemed that overnighting was permitted at Campo Imperatore so we decided to drive up instead, along a road that first took us away from our destination before swinging around and driving up through increasingly alpine scenery. 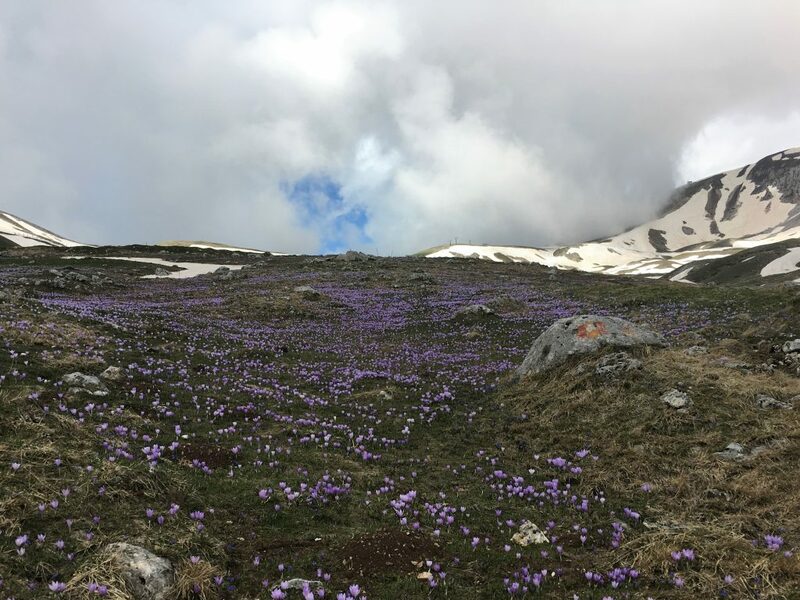 We drove past abandoned hotels (it seems a ski resort was started but never finished in the 80’s), between high banks of snow and past purple swathes of crocuses on the meadows where snow had recently melted. 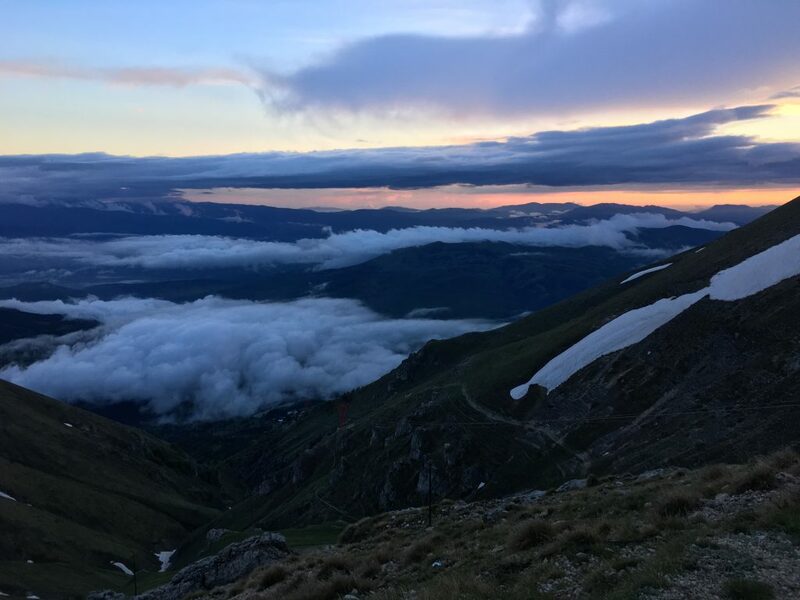 It was worth it for the drive alone, and the road was reasonable because the cyclists were due to ascend to the finish line here in a couple of days time. Having said that, there were a couple of guys shovelling asphalt into potholes so still a bit of work to be done before the Giro. 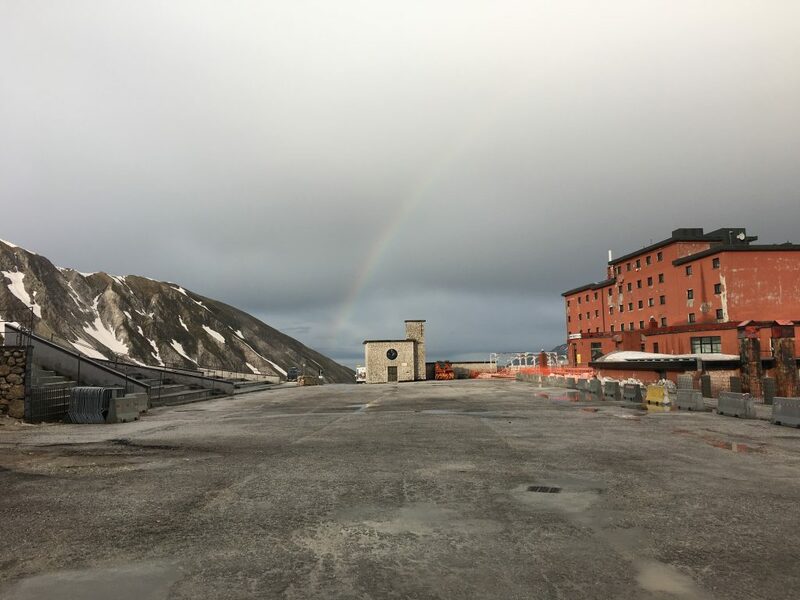 We were surprised at the tatty nature of some of the buildings at Campo Imperatore. I know that snow and cold weather takes it’s toll on buildings but we’d expected that some effort would have gone into making it more presentable. The following morning a crew arrived to start sweeping the car park clear of gravel and debris, but it was obvious that there was no time to make the hostel more respectable. I assume the TV crew would work their magic. As we were driving we were sussing out possible spots to park up and watch the race, but after looking on facebook we realised that the road was going to be closed for at least 10k and no one would be able to park along that stretch even if we were in place before the roads were closed. We investigated parking further down and walking up to the race, but in the end decided we could make better use of the day. 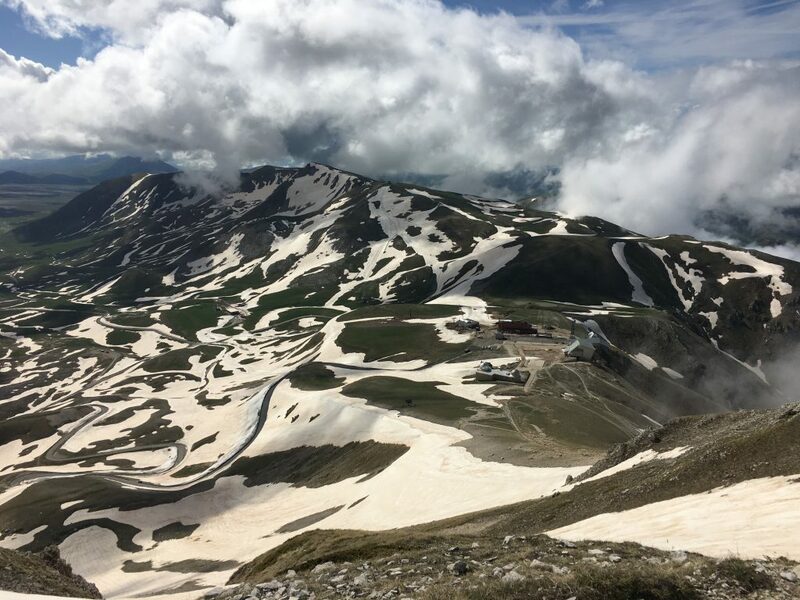 To make the most of our trip to Campo Imperatore and the brilliant morning sunshine we walked up past the silver domed observatory to the Rifugio Duca degli Abruzzi that can be seen on the ridge above the parking area. 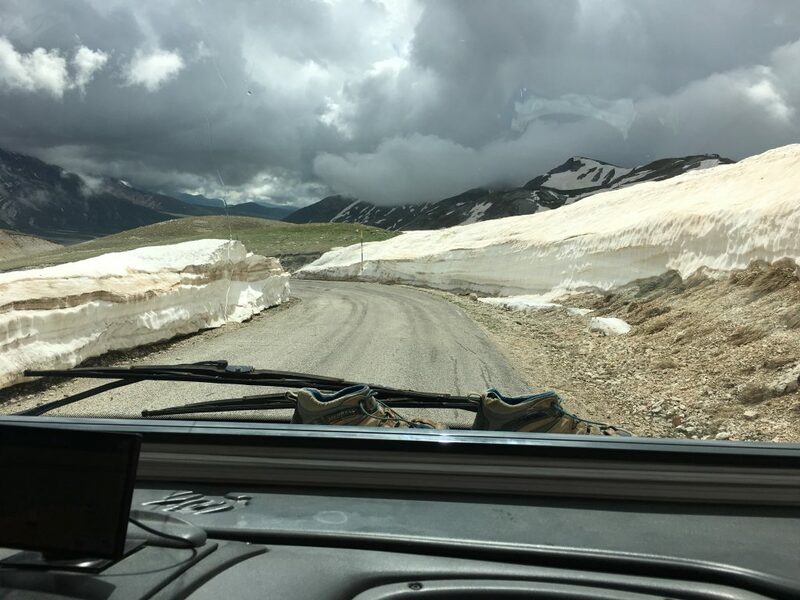 Even at this altitude we needed to cross or avoid snow patches. A ski mountaineer was hot on our heels. I couldn’t envy him, to me there is no cost benefit to slogging uphill in ski boots for five minutes of skiing, I’m definitely the type of skier who likes to be hoisted uphill by mechanical means. Once on the ridge we were able to walk along it’s crest for a little while before hitting the next patch of snow that was too dangerous for us to cross. It was just a short walk but the views or Corno Grande and the basin beyond the ridge were worth it. Looking back down to Campo Imperatore from the ridge above, can you spot Bertie? This wasn’t the last we would see of these mountains – in the next few days we were going to tackle them from the other side.